KMC Music Inc ES0616-PS - The ebony pinstripe heads are made with two 10 and 5 mil Mylar plies with a measured layer of a ring reducing agent applied between them at the outer edge of their trademark stripe to dampen high frequency overtones for warm resonance. Ebony pinstripe's quick decay makes them ideal heads for the "fat" sounds of Rock and R&B and for those who want more low end sounds with moderate attack and response characteristics. 16" diameter snare/tom drum head. Made with two 10- and 5-mil mylar plies with a measured layer of a ring reducing agent applied between them at the outer edge of their trademark stripe to dampen high frequency overtones for warm resonance. Ebony pinstripe's quick decay makes them ideal heads for the "fat" sounds of Rock and R&B and for those who want more low end sounds with moderate attack and response characteristics. KMC Music Inc BX-0114-10 - The emperor x drumheads are the most durable Mylar heads in the world. They’re made with two free-floating plies of 10-mil Mylar film with a 5-mil reverse black dot, which gives consistent focused warm tones which accounts for their popularity among many of today’s hardest hitting Rock drummers. Made with two free-floating plies of 10-mil Mylar film. 5-mil reverse black dot, which gives consistent focused warm tones which accounts for their popularity among many of today's hardest hitting Rock drummers. 14" diameter snare/tom drum head. The most durable Mylar heads in the world. Remo Ambassador Hazy Snare Side Drumhead, 14"
Remo Powerstroke P3 Clear Bass Drumhead, 22"
Remo PP-1470-PS Pinstripe Clear Tom Drumhead Pack - 10", 12" & 16"
Remo PP-0910-PS Pinstripe Clear Tom Drumhead Pack - 12", 13" & 16"
Remo PP-0960-BE Emperor Coated Tom Drumhead Pack - 10", 12" & 14"
KMC Music Inc ES-1622-PS - The ebony pinstripe heads are made with two 10- & 5-mil Mylar plies with a measured layer of a ring reducing agent applied between them at the outer edge of their trademark stripe to dampen high frequency overtones for warm resonance. Made with two 10- & 5-mil mylar plies with a measured layer of a ring reducing agent applied between them at the outer edge of their trademark stripe to dampen high frequency overtones for warm resonance. 22" ebony pinstripe bass drum head. Ebony pinstripe's quick decay makes them ideal heads for the "fat" sounds of Rock and R&B and for those who want more low end sounds with moderate attack and response characteristics. Ebony pinstripe's quick decay makes them ideal heads for the "fat" sounds of Rock and R&B and for those who want more low end sounds with moderate attack and response characteristics. 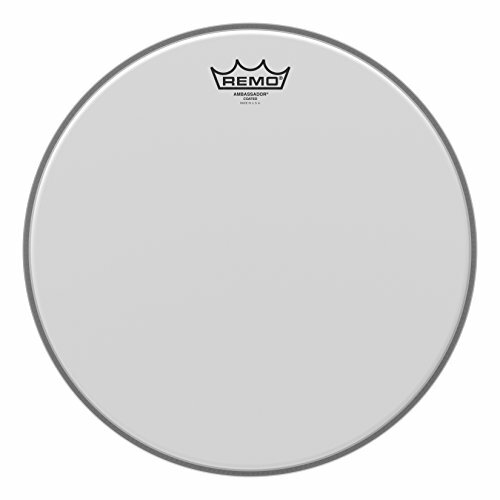 KMC Music Inc CS-0114-10 - Coated controlled Sound heads are one of Remo's most preferred snare drum heads. 14" diameter snare/tom drum head. 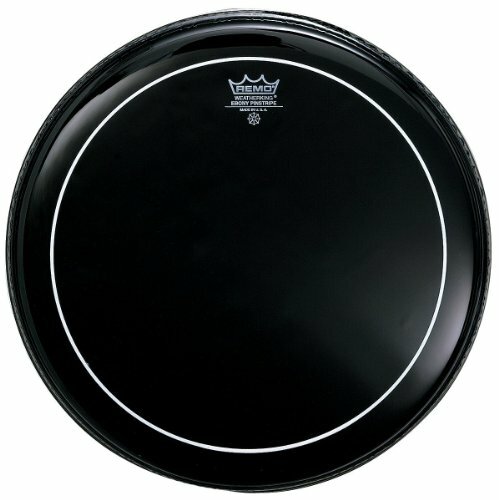 Medium and heavy-duty drumhead characteristics. Coated with black dot on bottom. 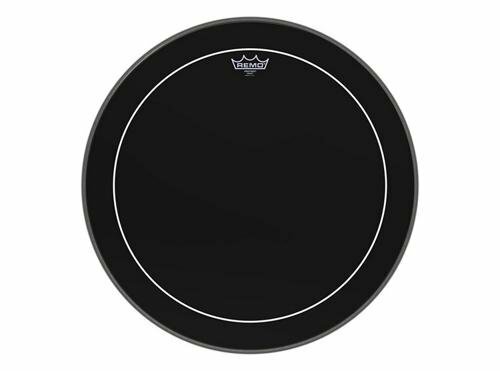 Coated controlled Sound drumheads have medium and heavy-duty drumhead characteristics. The outer area of the head’s playing surface offers mid-range tone and sensitivity while the laminated center “dot” adds durability and tonal focus. The outer area of the head's playing surface offers mid-range tone and sensitivity while the laminated center "dot" adds durability and tonal focus. Coated controlled sound heads are one of Remo’s most preferred snare drum heads. 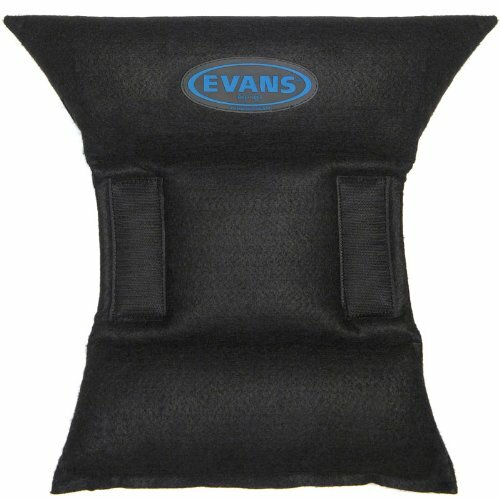 Evans EQPB2 - Made for double-pedal, this non-slip black nylon bass drum patch softens attack slightly and strengthens the head without affecting sustain or low-end. All evans drum heads are designed, engineered and manufactured in the USA. Double pedal black version. Protects the bass drum head from pedal fatigue. 2 patches per package. Increases attack without affecting sustain or low end. Remo RemOs Tone Control Rings Pack - 10", 12", 14", 16"
KMC Music Inc ES0615-PS - Ebony pinstripe's quick decay makes them ideal heads for the "fat" sounds of Rock and R&B and for those who want more low end sounds with moderate attack and response characteristics. The ebony pinstripe heads are made with two 10 and 5 mil Mylar plies with a measured layer of a ring reducing agent applied between them at the outer edge of their trademark stripe to dampen high frequency overtones for warm resonance. 15" diameter snare/tom drum head. Ebony pinstripe's quick decay makes them ideal heads for the "fat" sounds of Rock and R&B and for those who want more low end sounds with moderate attack and response characteristics. Made with two 10- and 5-mil mylar plies with a measured layer of a ring reducing agent applied between them at the outer edge of their trademark stripe to dampen high frequency overtones for warm resonance. Evans Hydraulic Red Drum Head, 14"
D'Addario &Co. Inc EQ-PAD - The eq pad is an adjustable bass drum muffler that enables control over attack and sustain. 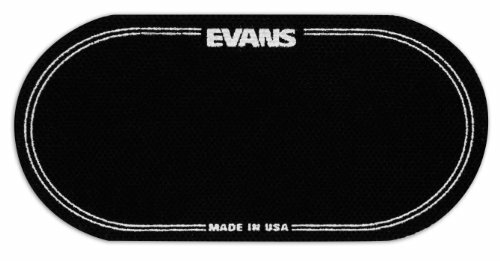 All evans accessories are designed, engineered and manufactured to the most stringent quality controls in the industry. A hinged damping pad bounces off the head upon impact, allowing some minimal resonance before returning to full damp the head. Attaches to bass drum shell with Velcro. Hinged pad bounces off the head, allowing sustain before returning to dampen the vibrating head. Smaller pad on opposite end that can be used on smaller drums or for minimal damping. 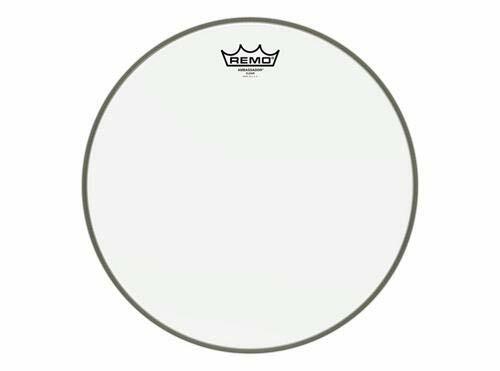 KMC Music Inc BA-0114-00 - Constructed with 1-ply 10-mil Coated film, Ambassador Coated drumheads are the industry standard for all applications. 1-ply 10-mil Coated Film. Available in sizes 6" - 40". Available in sizes 6" - 40". The worlds most popular 1-ply Coated drumhead. Provides bright attack and controlled sustain. Ideal for tom, Bass and Snare batter applications. The ambassador coated is the most popular drumhead in the world, featuring the perfect combination of warm, open tones with bright attack and controlled sustain. 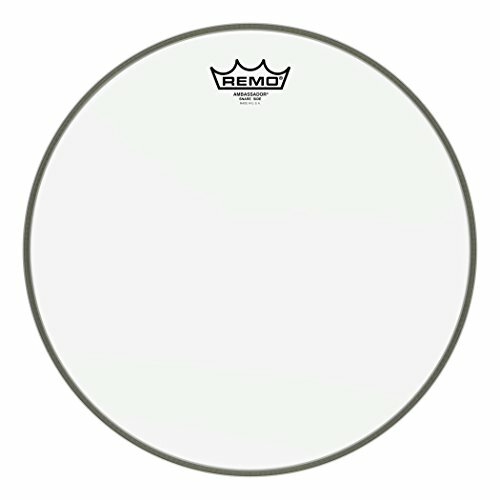 Remo PP-1390-BA Ambassador Coated Tom Drumhead Pack - 10", 12" & 16"
Remo PP-0930-BA Ambassador Coated Tom Drumhead Pack - 12", 13" & 16"
KMC Music Inc SA-0114-00 - The hazy ambassador heads are medium-weight heads made with a single-ply 3-mil Mylar film to produce an open, bright, and resonant sound with plenty of attack. Factory-supplied drumhead of choice for almost every OEM because of their tunability and tone. Hazy ambassador heads accentuate snare drum response and give a classic look to snare drums Referred to as the worldwide industry standard batter heads for studio and live applications. Also known as the Timbale drumhead. KMC Music Inc BA-0314-00 - Available in sizes 6" - 40". Ideal for tom, Bass, batter and resonant applications. Most popular for Tom resonant head. 1 ply 10-mil Clear film. Available in sizes 6" - 40". Constructed with 1-ply 10-mil clear film, Ambassador Clear drumheads are used as batter heads and are the industry standard Tom resonant drumheads. 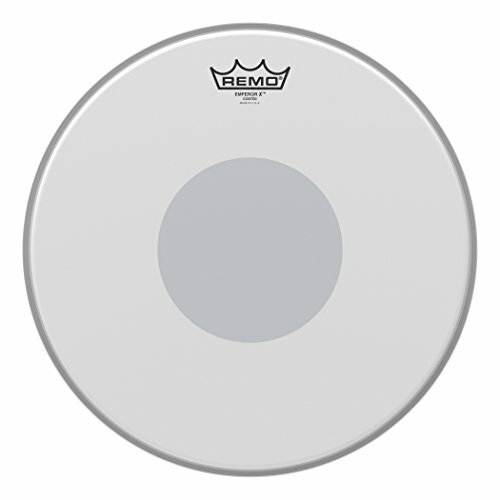 The ambassador clear drumhead features an open, bright and resonant sounds with plenty of attack. Provides bright, open tones with volume and clarity. Remo PP-1380-BA Ambassador Clear Tom Drumhead Pack - 10", 12" & 16"
Remo Pinstripe Clear Drumhead, 14"
Avedis Zildjian Company P1300 - 8 fl. One quick and easy application. Note: clean around any ink logos, as this polish will wipe them off. Not for use on traditional finish, Kerope or ZXT Titanium cymbals. Use on brilliant Finish Cymbals only. Clean around ink logos. For non-brilliant finish cymbals, using a soft dry cloth is recommended. 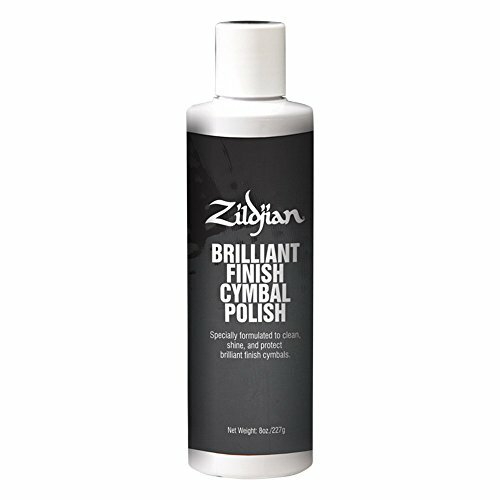 The zildjian cymbal cleaning Polish is specially formulated to clean and polish Zildjian brilliant finish cymbals. Music Accessories World is a participant in the Amazon Services LLC Associates Program, an affiliate advertising program designed to provide a means for sites to earn advertising fees by advertising and linking to Amazon.com.